Tanzanite is the name used for the vivid violet blue color of the mineral zoisite. The violet blue color is almost always produced by heating brownish or greenish zoisite. But due to the market enthusiasm for tanzanite, other zoisite colors are being marketed under the tanzanite name. Zoisite is a calcium aluminum siilcate that was first discovered in the Austrian Alps in 1805. It was named after the mineralogist Sigmund Zois (1747-1819), who first identified it. It was not a particularly important mineral until a new variety of transparent crystalline zoisite was discovered in Tanzania in 1967. With the help of Tiffany & Co., tanzanite became an important stone in the colored gems market. Natural zoisite occurs in a number of colors, include blue, green, yellow, orange and pink. Strictly speaking, non-blue zoisite should be refered to as "fancy colored zoisite" or "fancy zoisite." But because of the market success of tanzanite, all gem-quality zoisite tends to be sold under the name tanzanite. In fact the rarest of all zoisite colors is pink, and good quality specimens are much sought after by collectors. The opaque massive form of pink zoisite is known as thulite and is relatively common. But the pink color is very rare in crystalline form, and transparent zoisite in any shade of pink is quite valuable. Collectible pink tanzanite should be natural and unheated, and uncut crystals specimens, as well as cut and faceted gems, are highly valued. Pink tanzanite is so rare that many dealers have never encountered it. 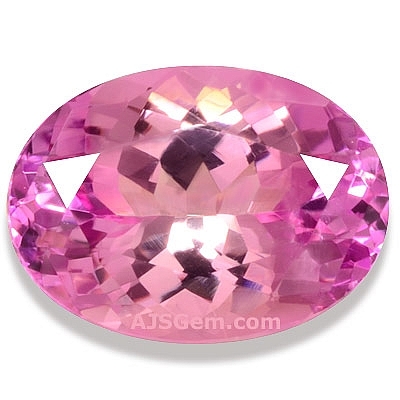 Usually specimens of pink tanzanite have a strong tint of orange, or are at best a salmon pink. 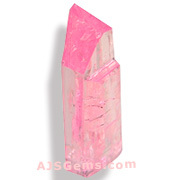 Pure pink material, such as the specimens shown from our collection, is exceptionally rare.